Philadelphia Union’s emphatic 2-0 victory over New York City FC was the culmination of the club’s season long commitment to playing confident and, as manager Jim Curtin said after the game, “brave” soccer. On a humid Saturday night in Chester, the Union were finally able to assert their will on a team at the top end of the table with some dazzling ball movement and smart defending. After an early season of missed chances and defensive lapses, the league is starting to see the Union’s risky style of play finally coming to fruition. Moreover, it was the Union’s movement — finally! — that was the real difference for the club. Too often this season, the Union attack has been stagnant and relied too heavily on crossing; on Saturday, fans saw what fantastic play the team is capable of when everyone is active and optimistic off the ball. As others have already extolled in their analyses, Alejandro Bedoya’s run opened up the field for Cory Burke’s opener and it was a nice switch of play that created space for Ilsinho to do his thing, so I’m looking at some of the plays not on the highlight reel that allowed the Union to dictate play for nearly the entire 90 minutes. First, let’s start with how Philly foiled NYCFC’s offensive tactics. 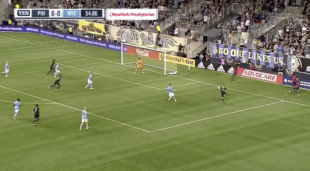 From the very first minutes of the game, it was clear NYCFC manager Domenec Torrent wanted to exploit Philadelphia’s counter-press and high back line by playing balls over the top to the club’s dangerous attackers. Whenever NYCFC won the ball back, David Villa immediately checked to the ball and held it up for a central midfielder to play a long ball to a streaking attacker. The tactic nearly led to a few breakaways for the visitors in the first half. But Jim Curtin rightly adjusted his squad in the second half to cut off this option. Below, Haris Medunjanin — defensive inadequacies aside — doesn’t have to jet back to chase down a runner. Instead, after a post-corner kick turnover, he cuts off the easy outlet pass to give his defenders time to recover and shut down City’s counter. Later, it was Jack Elliott stepping way up after a turnover to pressure NYC’s midfield and create a turnover in favor of the Union. Folks, that’s your center back 35 yards from goal breaking up a counterattack. Brave counter-pressing at its finest. From the outset, Philadelphia did not shy away from attacking City through the right wing. The plan was clear: Swing Bedoya out wide with both Medunjanin and Borek Dockal supporting movement from the middle of the pitch. It was easy, beautiful football… pass, move, pass, move. Below, that pass-and-move mentality — players overlapping and creating space — drew the Pigeons’ entire central midfield to the right side of the field. This opened up the middle of the pitch for the Union. David Accam sees the space and wisely sets up at the top of the box, where Dockal served him a delicious line-breaking ball. Also note: C.J. Sapong and Cory Burke doing some work here pulling both central defenders away from Accam. A+, dudes. Philly’s tilt toward that right wing yielded what many fans have been clamoring about for a very long time… Alejandro Bedoya, winger. In all those clips, you see Alejandro Bedoya and Keegan Rosenberry sitting on the touchline playing tiki-taka, while C.J. Sapong pinches in and does what he does best: Occupy center backs. This opens up the middle of the field for Medunjanin and Dockal to find space and break down City’s defense. And — GASP — It’s basically a malleable 4-4-2 with Sapong joining Cory Burke in the middle of the pitch to open up the field. In the past, the Union’s defense often looked like a 4-4-2 with the No. 10 pressing high alongside the striker. With Sapong on the right side, we’re starting to see it work on the attack too. So maybe Jim Curtin isn’t so tactically inflexible after all, no matter what the lineup card says. That one pass took four NYCFC defenders out of the play. Dang. Yeah, so Ilsinho’s goal was mad filthy, we all know. But he did so much more on the play! When the Union turn the ball over deep in NYCFC’s box, Ilsinho is quick to press and force an errant pass that falls right into Bedoya’s lap. Excellent defensive work for the Brazilian. Bedoya quickly recycles play and we all know what happens next. You wanna talk about playing out of the back? Talk about having a team feeling confident in each other. That’s Dockal putting Trusty in a really tight space and the youngin’ playing it out like a cool veteran and springing a counter. I remember watching that Dockal back pass to Trusty in traffic and turning to my girlfriend saying “Now that takes confidence in your center back.” At the time I thought he was just going to blast it out of the back but he had his own confidence to work it out instead of possibly turning it over. It’s incredible to watch this team pass, especially out of the back. I ranted about Sugarman and lack of spending in the other post but there is several times a game now, where I turn I my dad and praise the way this team passes now. Nice job on integrating the video clips! explanations clear, nicely done. Appreciate the insights. Love the video clips. Very clear info! Very Adam Cann esk. I mean that as a compliment. My brain won’t hold onto all the plays so the video clips are great! Great analysis and clips, Steven. Enjoyed it. Really well done Whistles. Can you analyze why we got killed on Sunday even though we were up a man at Starr? I just want to point out that in clip #2, where you highlighted Medunjanin cutting off the outlet pass, what stands out to me is Rosenberry taking perfect defensive position beside a streaking NYC winger, thus preventing an even-more-dangerous pass (that he was looking to make).